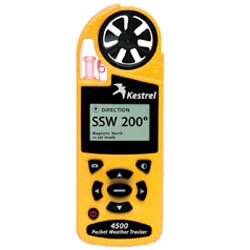 The 4500 is the most advanced handheld weather station from Kestrel featuring a wide array of instruments. The unit comes with a digital compass, an anemometer that calculates crosswind and headwind/tailwind with reference to a user-set target heading(! ), barometric pressure with trend, temperature, humidity, altitude, wind chill, heat index, date,time and dew point. All the features are recorded and logged in a 2000 data point memory, graphics can be used to show the different variables and trends. The unit is small enough as a GPS receiver and has many modes of operation that can't be described in this small review, you can take a snapshot of temperature, humidity and pressure. Keep recording even with the unit turned off, customize the screens to display the data that you need the most etc. The unit uses only two AAA batteries and has a backlight for night operation. It is of course water proof and it floats. The 4500 is a complete handheld weather station and also a data-logging device that can be moved easily to any location. Both for outdoor enthusiasts or people interested in weather it is a wonderful handheld. It has a price but for a weather geek it is as any mobile weather station can be. The Kestrel 4500 can be ordered in yellow or in a military version with Olive Green case and red backlight to preserve night vision. The retail cost is $400 and you can order or read more following this link.